Kyprianou flew to London for discussions with British Prime Minister Margaret Thatcher. A memo of their conversation is one of a number of Foreign Office documents that were made public last week. “He [Kyprianou] had been told that if he felt that Greek troops should go to Cyprus, and he so requested, the Greek Government was ready to meet his request,” the declassified note said. Thatcher is recorded as commenting that such action would be “a very big decision” and that “the hazards of military intervention should be avoided”. 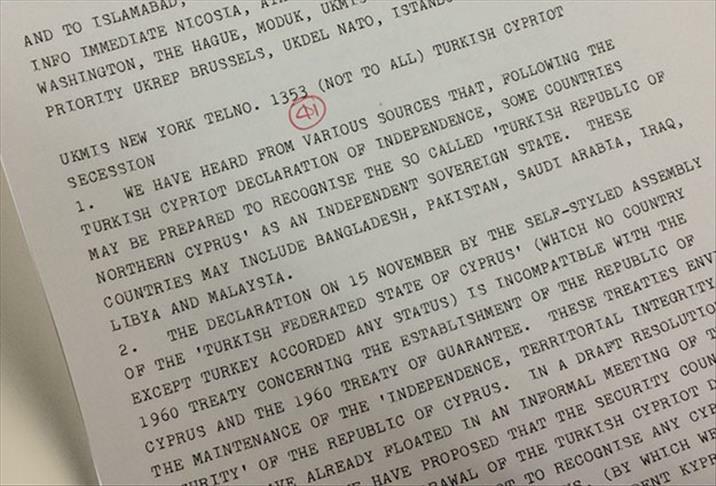 According to James Ker-Lindsay, a senior research fellow on politics in southeast Europe at the London School of Economics, the declassified documents offer an insight into events following the Turkish Cypriot declaration of independence, which came after eight years of failed negotiations following a Greek-Cypriot coup in 1974 and subsequent Turkish military intervention. “It is a terribly interesting revelation about potential Greek troops but it doesn’t quite stack up,” he said. “[Papandreou] was hawkish, no doubt about it, but a military response seems to be a very odd reaction. What did he want to do with the troops – to go and take back the north or to keep them in the south? Kyprianou’s decision to keep Greece’s offer of military support secret may have prevented the deployment of Greek troops on the island’s south. Turkish troops have been stationed in the north since 1974. “There was a strong feeling in Greece that, following Greece’s inadequate response to the events of 1974, inaction or indifference on the part of the present Greek government would not be tolerated by public opinion,” reported the note of the meeting between Kyrianou and Thatcher two days after the TRNC was declared. The new-born republic in northern Cyprus was heralded by Rauf Denktas, the founding president, as giving Cypriot-Turks equal status in negotiations over Cyprus’s future. But only Turkey offered diplomatic recognition to the fledgling country while the outside world rallied behind a swift UN Security Council resolution that called the declaration of independence “legally invalid”. The declassified papers also revealed several nations were preparing to recognize the TRNC – something that caused concern in Britain, the island’s former colonial power. The concerns were great enough for the foreign secretary of the time, Geoffrey Howe, to instruct British diplomatic missions to lobby six Muslim-majority countries against recognizing the new state.